St. Sebastian | Wheat, Not Oats, Dear. I had debated writing this blog about my recovery from surgery, even in part–but then I realized that I have nothing else to write about, at the moment; nothing doing. You’ll have heard the expression “hanging fire”? [I did see a terrifically cool moth with my friend Katie last weekend, but I don’t think you want to hear about it; Katie didn’t, and she was THERE.] This week’s blog will not, for instance, detail my adventures while scaling Russia’s Mount Elbrus [“And then I dropped my flashlight down a crevasse–Vladimir and I sure were scrambling!”] This blog will not include any banter I have been lucky enough to overhear on public transportation. It will not discuss the operation of heavy machinery, which I am not allowed to do right now! Ha ha! A little “prescription medication” humor for you, gentle readers. Even of surgery, and the recovery thereafter, there is not too much that I will say. One does what one has to do. I have assembled the following list of thoughts, and we will leave it there, won’t we? c. Pictures of flowers, ’cause that’s what the ladies like! 4. No, I’m kidding–I wouldn’t say that to them. 5. Apparently, I have “funny valves” [actual term used by actual medical professionals] in my veins. This phrase has been placed high atop my Most Searingly True Life Metaphors of All Time List. Funny valves? Seriously, I’ve cracked a few codes with this piece of information in the past week. 6. If you are reading “Little Dorrit”, by Charles Dickens, you will not be able to read it in the days immediately following your procedure, for Dickens and recovery go together like salt and Lot’s wife. One moment you are lying on the couch, awake-ish and reading; one sentence later [“Deuce a bit!” said Pancks. “What do you think it’s worth?”] you are dead to the world and dreaming, probably that one dream, the one with the wheelbarrow. 7. I have really, really, really, really, really really wonderful friends, who burst my heart with their wonderfulness. 8. Get well cards often have glitter. 9. I like to sleep. I have not been home for such an extended period of time in quite a while. It’s very nice; as very nice as home can be, under the circumstances. My youngest brother and sister are home from college for the summer, and another of my brothers is about as well, and there have been many ice cream sandwiches, and much watching of Sports Center. When I watch Sports Center I know I am home; I feel the latent sports-lover in my heart, stretching itself like a boomslang snake on a warm rock. I say things like “Great catch” while watching sports highlights, and I mean it. It is in my blood: I cannot help it. My brother-in-law asked one of my brothers last night about the possibility of pulling together a fantasy football league, and who might be interested. ME: Oooo, I want to do it! ME: What if I asked my friend Adam to make all my picks for me? MY BROTHER-IN-LAW: [pause.] I’d have to talk to him. I will report back if, indeed, I am allowed to join a fantasy football league. Hey! Hey. Don’t laugh at me. On Saturday I was going through pictures my mother has saved on her computer. There are many, many pictures; pictures of birthday parties, of weddings, of babies. I decided that it would be only too proper to share some of these pictures with you. They are a Taste of Home; it’s where I’m at right now, where I currently [for at least another week] live and move and have my being, and so I share them, since pictures are worth o-many-thousands of words. My youngest sister attends Purdue University [Go, Boilermakers!] 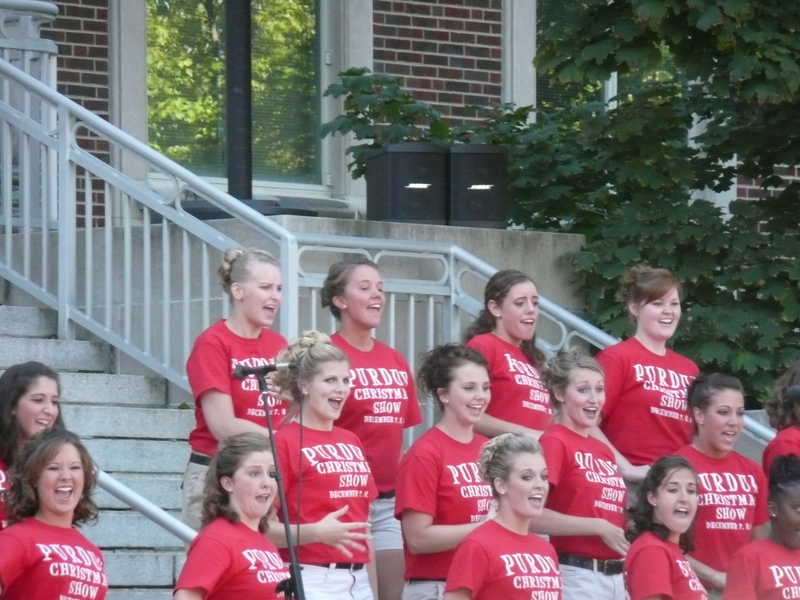 and sings with their prestigious women’s singing group, the Purduettes [this is their real name]. Back row, third from the right: that’s our little pride and joy. I want you to look at the faces of these young women. Now put that look on your OWN FACE and GO OUT INTO THE WORLD. “Hello, world!” I want you to say [I will say it, too–don’t worry]. “Here I am! It’s me, _________! I bet you thought I forgot about you!” And then I want you live your life like God intended. This is a picture from my cousin’s wedding last fall. 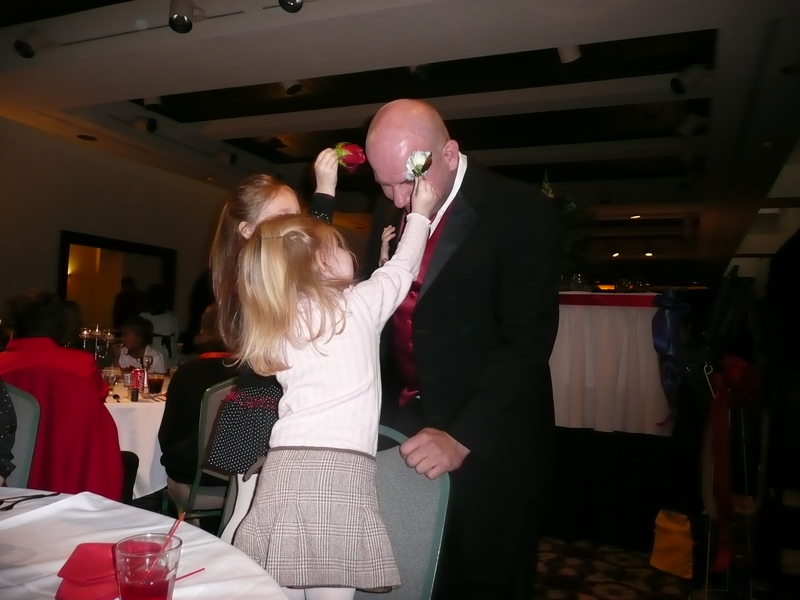 My nieces are touching my brother’s head with roses. What can I say of such a picture? The words “darling”, “heart attack”, and “so darling I almost had a heart attack and died” suffice for me. 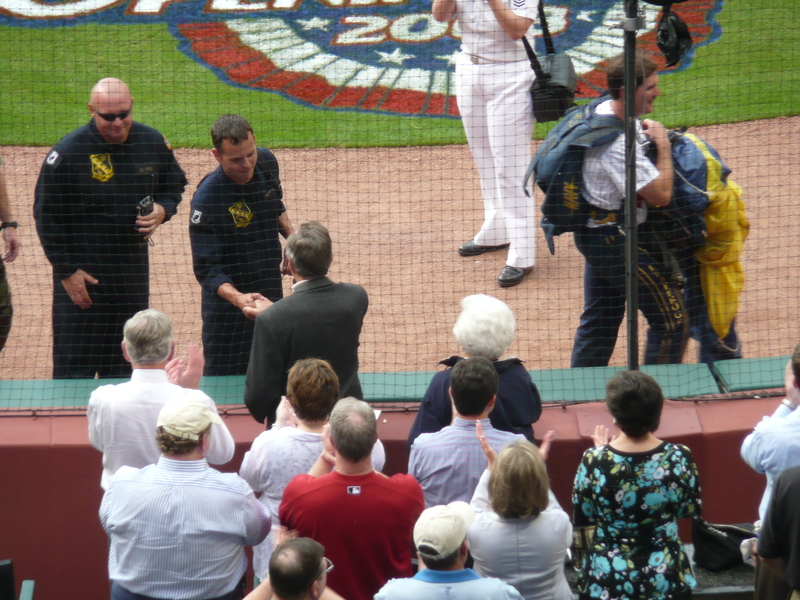 This is a picture of one of my younger brothers, Matt–who is in the Navy, and the announcer for the Navy Leap Frog team–shaking hands with the former President Bush at this year’s season opener between the Houston Astros and the St. Louis Cardinals. I just wanted an excuse to use this picture. 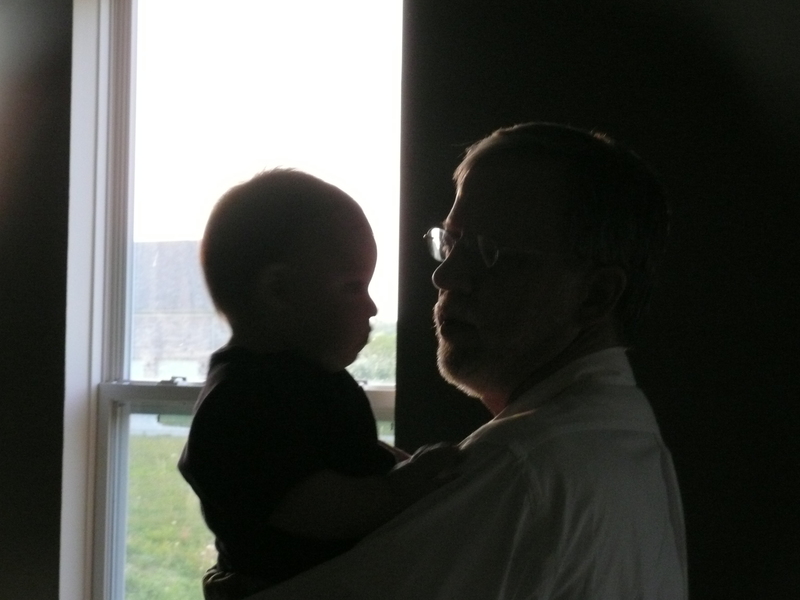 My father and my youngest nephew, Dominic. Dominic is the roly-polliest, loving-est, drooliest sweetest dearest baby boy in all the world! Also, he bench presses about 250. MY BROTHER ANDREW: [eating Chinese food] I just got a bite of beef, chicken, and noodle all in one. The following poem is a poem I have posted elsewhere, already, in other times. But I love it so very much that I’m posting it again today, here, right now.